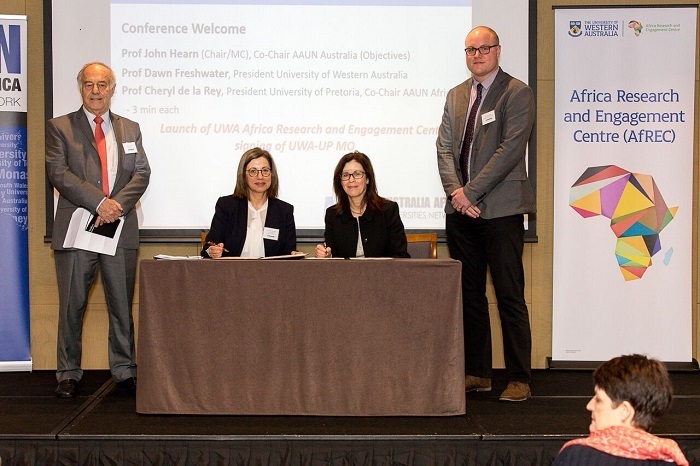 The University of Pretoria (UP) and The University of Western Australia (UWA) today signed a memorandum of understanding (MoU), that seeks to enhance relations between the two universities by developing academic and cultural interchanges in teaching, research and other activities. This agreement, which has been in the making for the past six years under the auspices of the Australia-Africa Universities Network (AAUN), signals the formalisation and strengthening of a number of interdisciplinary projects over the next five years. This agreement was completed with the strong support of the Vice-Chancellor and Principal of UP, Prof Cheryl de la Rey and the Vice-Chancellor of UWA, Prof Dawn Freshwater. The agreement was signed on the sidelines of the AAUN’s Annual Conference and Annual General Meeting taking place at The UWA. The AAUN was launched in 2012 to focus engagement of Australian universities in sub-Saharan Africa to enable the provision of specific expertise across areas of priority for Australia and Africa. “With this agreement we will fulfil our ambitions and objectives in building equal higher education and research partnerships and programmes between our two institutions. This partnership is vital as it brings together two universities from different continents to join hands and to catalyse new research collaborations that address significant challenges facing both Australia and Africa,” said Prof De la Rey. Earlier in July, UWA announced the establishment of the Africa Research & Engagement Centre (AfREC) to drive innovative and ethical collaborations on the African continent. The centre develops, produces and promotes research, teaching, training and other academic collaborations with university partners in Africa, Australia and globally to address mutual sustainable development challenges and responsibilities, while strengthening wider Australia-Africa relations. Prof John Hearn, AAUN Australia Co-Chair; UP Vice-Chancellor and Principal, Prof Cheryl de la Rey who is the AAUN Africa Co-Chair; Prof Dawn Freshwater, Vice-Chancellor of The UWA; and Dr David Mickler, Director of the Africa Research and Engagement Centre at The UWA. This brings to eight the number of agreements that UP has signed with other international tertiary institutions this year, including with the University of Illinois at Urbana-Champaign in the US and the University of Bologna in Italy, both of which are highly ranked in the latest QS Rankings. Last year UP signed 16 new institutional agreements, including with the Technical University of Munich (Germany) and McMaster University in Canada.